Bonjour tout le monde! It has been 922 days since my last blog post. Please forgive my absence, I’ve been working on some major things. First, in fall of 2015, I returned to school to get my AA degree. It started simply as me returning to take a French course to occupy my time as my life was changing, once again. Here’s what they don’t tell you: life is constant change. Sometimes that change is devastating and you have to learn to start again with a new level of courage and bravery you never thought you could possess. At the time, it seems almost unbearable, but you take it one step at a time and one day at a time because that’s really all we get, right? Each single day, one of them at a time, one hour, one minute, one second at a time. I was a horrible student when I was younger. After many failed attempts and a rather successful career in the legal field, I gave up on it (temporarily). What I did not realize was that my career in law taught me something very special: how to learn. At the suggestion of a friend and with much hesitation, I returned to school to do something I enjoyed – further my education in french. I’ve had a lifelong obsession with all things french. I have often felt as if I were born in the wrong country (sorry America, I love you, too, but just not in the same way as I love France). 922 days ago, I was enrolled in summer school at community college. This was 11 months after I first walked into a class room again after a 17-year hiatus. If you asked me 922 days ago if I would be where I am now, I would not believe you. Second, I completed my AA degree in Fall of 2017 and applied to transfer to California State University, Long Beach and California State University, Fullerton. On October 10th, 2017, I was accepted to both schools. This was just 21 days before the University of California applications opened on November 1. You see the timing of how I finished my AA degree, would make me ready to transfer in spring 2018. I could not imagine waiting for another 9 months to continue my education because the UCs only accept for fall entry. I had to strike while the iron was hot. The iron was so hot that I decided to roll the dice and apply to four of the University of California (Los Angeles, Berkeley, Davis, and Irvine) for Fall 2018 admission. At first, I did it just to see if I could get in. Deep down, I wanted to know if I was good enough. And in April 2018, I found out I was granted admission to ALL FOUR UCs. The catch here is that the UCs do not take Cal State University transfers and my chance was that of ONE percent that I would get in. I spent nearly 30 days writing, rewriting, editing, getting feedback on all of my personal insight statements until I could no longer make them any better. To those of you reading this that took the time to read them, and offer feedback, thank you. Originally, I really wanted to go to UC Berkeley. I had been up there several times to visit my boyfriend and I fell in love with the tree covered streets, the immense lush greenery, and the incredible botanical garden. Berkeley waited until the very last day to release their admission decisions. In the meantime, Davis came through first on Friday, April 20th. I thought hey, I guess if my one percent chance is Davis, that’s not too shabby. I was shocked. I had prepared myself for the likelihood I would not be accepted anywhere given the statistics. On the following Wednesday, UC Irvine released their decision, followed moments later by UCLA. UCLA Royce Hall, November 2018. One of the original four buildings which was completed in 1929. LOOK at this place. Can you believe it? My most emotional reaction was being accepted to UCLA. I cried for two hours. I have wanted to go to UCLA since my older brother went to school there and graduated in 1984. Third, so here I sit, at UCLA as a bruin, writing and sharing my story. As if this story could not get any better, I am finally living the life I have always wanted. I am at UCLA (working my bruin hiney off). In spring quarter, I will get to do research with the professor that wrote the french textbook I returned to college with in 2015. I am taking class with her now and she is incredible. My dorm room with my UCLA bruin quilt my mother spent 9 weeks making. It’s been a hit here with the UCLA Alumni and the Transfer Center. Fourth, a lifelong dream of finally studying abroad in Paris will happen this summer in 162 days. For now, I have to get through winter quarter and while I’m taking 3 upper division french courses and ballet. Thank god for ballet! C’est moi avec La Tour Eiffel en avril, 2006. I can’t wait to finally update this and explore the city I love so much for five weeks! I will leave you with this, if there is something terrifying you that you wish to do – go for it. I am living proof that no matter how scared you are, you can accomplish great things. I had a dream of coming to UCLA since I was 7 or 8 years old and now… finally, I am here. It is terrifying, challenging, and one of the most rewarding things I have done to date. To each and every one of you that have helped me reach this goal- avec tout mon cœur, merci mille fois. I would not be here without you. Share in the comments what big plans you have for 2019. I’d love to hear from you! I hope your weekend was fantastic and you are ready for the week ahead. I am procrastinating on my 30 plus pages of reading for my Political Science class for Wednesday. Shhh… do not tell anyone, specifically my professor! Today I have a delicious, bright citrus flavored, and VERY simple recipe for the grill. I prepared the Creamy Avocado Lime sauce the day before. The avocado will not turn because of the yogurt, mayonnaise, and lime juice in the sauce recipe. I also cut the chicken, and made the marinade the evening before, and did not combine the two until the following day 2 hours prior to grilling. So go ahead! Make your life easier. One to two things out of the way the day before allows you more time during cooking time to enjoy a glass of wine, margarita, ice tea or lemonade. Even a Pimm’s Cup would go well with this refreshing summertime dinner. Soak up the summer. This is a crowd pleaser. This chicken was super juicy, bursting with citrus flavor from the lime. The dipping sauce was amazing with the creaminess of the avocado, slight tartness of the Greek yogurt, and the lime bringing all of it together in one harmonious sauce. Just make sure to pulse the avocado sauce several times. A few avocado chunks got away from me! The hot grilled chicken and the cold tang of the avocado dip are a match made in heaven. Chicken Marinade – Whisk lime juice and zest*, olive oil, Dijon mustard, garlic, salt, and pepper in a small bowl. Place chicken in a large resealable plastic bag. Add marinade and shake to coat. Refrigerate and marinate for 2 hours. 1 hour will work but 2 is better. During the marinating, take your skewers and immerse them into a bottle of water. I like my 1 liter bottle for this. It is impossible to get them stuck in there. You want them to soak at least an hour in the water. This will keep your skewers from playing flambé on your grill. Creamy Avocado lime dip – combine avocado, yogurt, mayonnaise, lime juice and zest*, garlic, salt, honey, pepper and cayenne pepper in a food processor or blender and pulse until creamy and smooth. Cover and refrigerate until ready to use. This can be made one day in advance. It will not brown. Hooray! It is day two and mine has not browned yet, either. * Use the microwave and heat the 5 limes for about 20-30 seconds. This will enable the maximum juice out of each lime. Get a few extra pulses in there.. some avocados do not want to give to the creaminess of this sauce. Preheat grill to medium-high heat and oil the grill grate. Skewer your chicken allow the marinade to drip thoroughly off. You do not want to slap down drenched chicken on your grill. It takes away from the gorgeous grill marks of the first sizzle sear. Discard marinade. Grill the skewers for 10–15 minutes, or until cooked through, occasionally turning the skewers. Place on a serving plate, sprinkle with chopped parsley and serve with avocado dip. I served this with my famous Armenian Rice Pilaf and grilled zucchini. For dessert, I finished with Clafoutis aux Cerises. I also think this avocado dip would be incredible on tons of other things like veggies for dipping, the sauce for a sandwich or a chicken wrap. Speaking of food, there are left overs! I am going to enjoy them again tonight. Pork could be subbed for the protein, perhaps even steak. I would however, allow the steak to marinate twice as long. 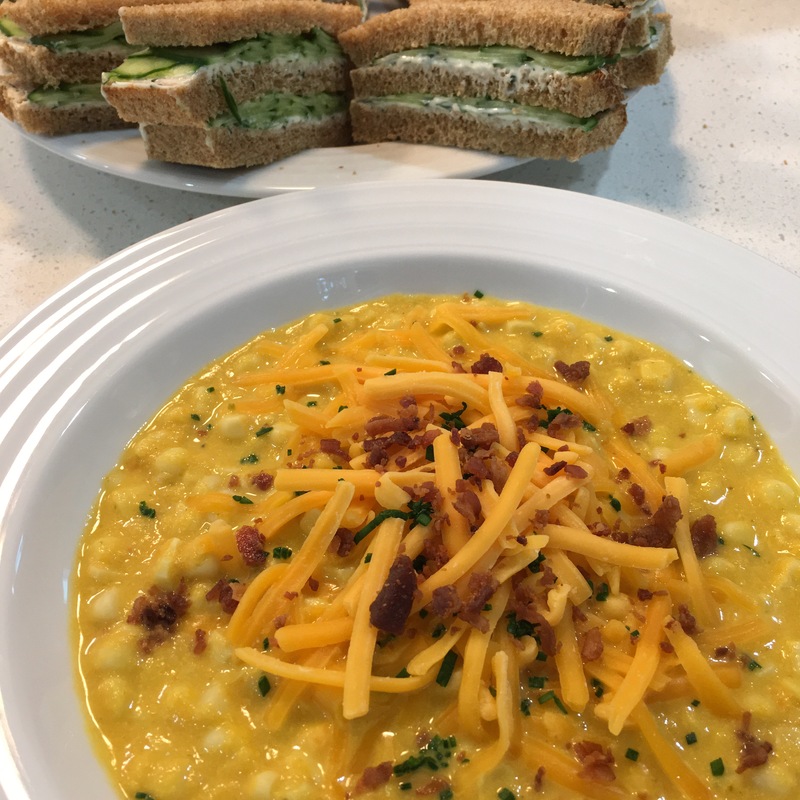 Have a fantastic week and do not forget, I am here to answer any questions you might have about this recipe or others, and even other cooking questions! Square Pancakes, Round Pancakes, Your choice! Happy Fourth of July! I know what you’re thinking, what am I going to make for breakfast today! I’ve got the perfect thing. You have a house full of people, right? Pancakes! Wait? you don’t feel like standing at the stove flipping pancakes for a mess of people? I’ve got your solution – square pancakes! Yup, Square. Grab your 9 by 13 cake pan and make this recipe that also doubles as your normal pancake recipe. If you feel like flipping pancakes, go right ahead. It’s two, two recipes in one! So, the recipe is for standard pancakes but what you’re going to do is grease/butter an 9 by 13 or 7 by 11 (thicker squares) pan and just pour the entire bowl of batter directly into the pan, then pop it into the oven and voila you’re done (after the baking, of course). You’re going to see that I strayed from the plan and used an oval, oopsie! The below recipe is easily doubled for more people. I sometimes like to add vanilla, cinnamon, nutmeg, mini chocolate chips and cloves. This recipe is very flexible. It is my one pancake recipe. I will never use another. This recipe is really no fuss no muss. In a large bowl, sift together the flour, baking powder, salt (again, only include salt if in a higher elevation) and sugar. Make a well in the center and pour in the milk, egg and melted butter; mix until smooth. If you want square pancakes, proceed to number 4. Heat a lightly oiled griddle or frying pan over medium high heat. I use my nonstick pan for this. Pour or scoop the batter onto the griddle, using approximately 1/4 cup for each pancake. You can also use an ice cream scoop for this as well. Brown on both sides and serve hot. In a 200°F oven reserve all the cooked pancakes in an oven safe dish until all the pancakes are made. Dress it up with blueberries. Pop them in as you’re making each individual pancake. This insures a blueberry in every bite. Make sure your blueberries are rinsed well and picked over, drained thoroughly and dry with several paper towels. No one likes a soggy pancake. Square OPTION* Preheat oven to 350°F and bake 20-25 minutes. If you’re adding fruit it will need about 10-15 minutes additional cooking time. I layered in my blueberries. I put half of them in first, then poured the batter in, then dumped more blueberries. I used a cup or a heaping cup of blueberries. Bake until a cake tester or toothpick comes out clean. Dust with icing sugar and pour over warmed maple syrup. Below are some images of the pancakes I’ve made, as well as the baked square pancake. Both options are delicious. If you’re feeling anxious and fidgety go right to the square pancakes. Blueberry Pancakes see the blueberries placed in each one? Enjoy your Fourth of July! Thanks for reading and have a wonderful Monday wherever you are on this great planet of ours. During Summer, I love corn chowder. Corn is one of the symbols of Summer to me. Corn is one of my favorite vegetables to grill. I finish the grilled corn with a cilantro lime compound butter on as soon as it comes off the grill. It has been rather hot here in California the past few weeks (I may have mentioned this a time or two). I have been hoping it would cool down just enough to make corn chowder. This chowder is slightly rich and velvety with the pop of fresh corn kernels. What could say summer more than this? I have been making this chowder for several years. It is also amazing at the turn of summer to autumn. I like to garnish it with bacon bits, some cheddar cheese, and chives. Place milk and halved corn cobs into a heavy bottom pot. Bring the milk and corn cobs to a boil, turn off stove, cover and allow corn and milk to steep and mise en place the rest of your veggies. In a large 3.5 quart soup pan at medium high heat, melt butter. Add onion then sprinkle with some kosher salt, and saute until translucent. This should take about 5 minutes, but do not let your onions brown. Add carrots and celery to pan, stir frequently and cook until vegetables are soft approximately 10 minutes. Turn down the temperature and add the garlic. Do not cook the garlic too long as the high heat may burn or sour your garlic. Give it a quick stir until it is slightly fragrant and then immediately add in the chicken stock-water combination (or water, vegetable stock, broth – your choice), herb sprigs, and bay leaves. Strain the corn cob steeped milk into your soup pan and discard the corn cobs. Increase the heat and bring to a boil. Cover partially and reduce heat to low. Cook for another 20 minutes. Now discard bay leaves and remove herb sprigs. Pluck off the remaining herbs and return the herb leaves to the pan and discard woody stems. Now, if you have an immersion blender, whizz up the soup. Use caution though, it is going to be hot. You can do this in a blender, in portions. Keep in mind the heat will pop the top off of your blender so only fill the blender about half full. You may wish to allow it to cool slightly. I really love my immersion blender for this purpose. No waiting! I whizz this through about 2-3 times. Season the soup with salt and pepper to taste. You may wish to add a couple of dashes of cayenne pepper and/or Tabasco sauce. Return pan to heat and add your uncooked reserved corn kernels. Cook on medium heat for about 15-20 minutes. Taste for alterations. Does it need more salt? More Pepper? I added cayenne pepper, white pepper, black pepper, and Tabasco. Just remember to give it a good stir and taste after each inclusion. This is the best way to monitor what goes in that you cannot take out! Please note, that when I add Tabasco or cayenne. It is not necessarily to make this inedible because it is too fiery hot. It is just to give it a depth, another layer of flavor that it will not have without it. Taste it, you’ll see. Of course, go crazy and make this as spicy as you wish. The choice is yours. To make this soup a little heartier, the addition of shredded rotisserie chicken would really make this into a main dish. 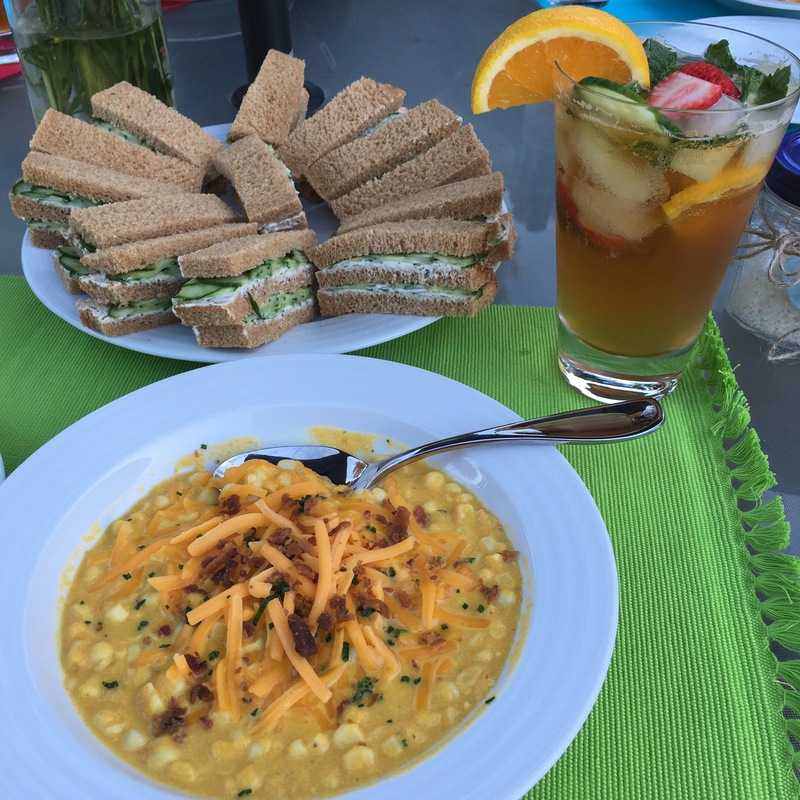 Now, I do not have my final presentation bowl to show as I made this to take to my besties house tonight for Pimm’s Cups, cucumber tea sandwiches, and Corn Chowder night. We are also busting out the pétanque set. I will be topping my chowder with shredded cheddar cheese, chives, and bacon bits. Stay tuned. I may just update it with the final presentation photo. Have a wonderful Canada Day or Happy Fourth of July! Either way, this soup should definitely be a part of your celebration. All of my French friends have been posting cherries all over their Instagram feeds, on Facebook, and on Twitter. It means one thing to me – Clafoutis! Every week, I check the prices of cherries and finally they were on sale a week ago. Happiness filled me as I thought about it finally being cherry season. I immediately wondered where my frosting tip was for the pitting the cherries. I’ve made this dessert enough over the last year, I decided it was finally time to get a cherry pitter. Let’s talk for a moment about said cherry pitter. I can hear the Alton Brown enthusiasts all screaming “no unitaskers!” Well, it is not a unitasker. It also pits olives.. in addition, it saves tons of time. The image below shows the usage of the frosting tip. It is exceptionally messy. I have made this dessert about 5 times with this method. It works but it is time consuming and messy. Now with Monsieur Cherry Pitter – 15 minutes or less to pit a little over a pound of cherries. Super clean, quick and efficient. I do not know how many times I can actually say this but I LOVE THIS Cherry Pitter. Let’s compare – 15 minutes, clean and efficient, or one hour with a frosting tip that is messy and time consuming. Monsieur Cherry Pitter wins. Pits down! I made this dessert a year ago on Father’s Day. This is a traditional French summer dessert. I know, I know, you are completely and utterly flabbergasted. I’ve made this recipe several times since last year and I feel it is finally ready to be shared with you, my lovely reader. Traditionally, Clafoutis is served avec the cherry pits! I have really tried to wrap my head around this one but I just cannot. I have a very handsome french male friend that disclosed to me under the strictest of confidence that he does NOT like it with the pits. If you’re reading this mon ami, je suis désolée, I did not reveal your name. I do know in Armenian cooking we utilize mahleb which is ground cherry pits for our sweet bread, Choreg. I decided to find something to replace the flavor of the cherry pits. I should back-up here and discuss the pronunciation – Klah-foo-tee (which I still get wrong and I take French and I am even a French tutor). It does not matter how you pronounce it, it is hands down delicious and EASY to make! Now, back to the missing pits.. I have substituted cherry pits with slivered blanched almonds and some Disaronno – which is almond flavored liqueur. I feel this accentuates the dessert just enough without it being overpowering. The French really have this masterful way of balancing the flavor palate. I did a lot of research on the flavors the cherry pits would add. By all means, if you want to use the pits, go ahead just forewarn your victims, I mean, guests. I like the fact the almonds also add an additional edible texture to the dessert. Also, if you are allergic to nuts leave out both the almonds and the Disaronno. I love this dessert for several reasons. I liken this batter to that of a crepe batter. The texture of the batter once cooked is super smooth, the cherries almost make warm jam filling with each bite. It is ALSO great as breakfast the following morning served cold. I normally serve this after it has cooled for about 30 minutes or so. It will be slightly warm. While it is still warm, I sprinkle confectioner’s sugar over the top via a fine mesh strainer. It gives it a light dusting. This dessert is not overly sweet. It relies almost completely on the fruit for its sweetness. I made this last year for my birthday party. I dusted the top with icing sugar, and gave all my friends a fork and we ate right out of the large oval baker. I know, it is complete insanity! In a large bowl, combine the flour, sugar, and salt. Using a stick blender, incorporate the eggs, one at the time, beating well after each egg. When the batter is smooth, mix in the melted butter. Gradually add the milk, mixing well, so no lumps form. Add in the Disaronno. Strain through a chinois *(fine mesh strainer). The batter should be perfectly smooth. Set this batter aside (preferably in the fridge) for at least 1 hour. You want the gluten in the flour to relax. No one wants stressed gluten! After the batter has rested for at least an hour, preheat the oven to 392°F and generously butter a 11 inch tart dish. I use my large Le Creuset oval baker for this. Using your hands, scatter the slivered almonds, then the pitted cherries into the prepared baking dish. Gently pour the batter over the cherries and almonds. Bake for 30 minutes or until golden and quite firm. Wobbly in the middle is fine. Insert a cake tester into the center, it should come out clean. Slice the Clafoutis and serve with a dusting of icing sugar. Refrigerate the remaining dessert. I love this dessert, have I mentioned that? *Chef’s Note – While I have not used another fruit, one could use plums, berries, figs, apricots. Do not be shy. If there is something you love better, go for it! Happy Summer Solstice! Happy Winter Solstice on the other side of the world! As you may know, it’s super hot in California at the moment. Any time is a good time to find refreshing treats to help cool you down during summer. One of my favorite and simplistic summertime treats are Nutella Popsicles. 2 ingredients, your stick blender and popsicle molds and you’re ready to go. It truthfully does not get any simpler than this. These popsicles are amped up fudge pops! I love my tovolo popsicle molds. They come with a convenient lock-in base which keeps your popsicles still and stable during transport and freezing. The popsicle stick locks into the sheath. The sheath comes off very easily with just about 30 seconds to a minute under hot water. These are freaking delicious! For those of you in winter solstice… just flip this into your sauce pan and warm slowly over low heat. Voila! Nutella hot cocoa! Spike it with some frangelico. See what I did there? Fantastique! Pour your milk into your stick blender vessel or into your blender. 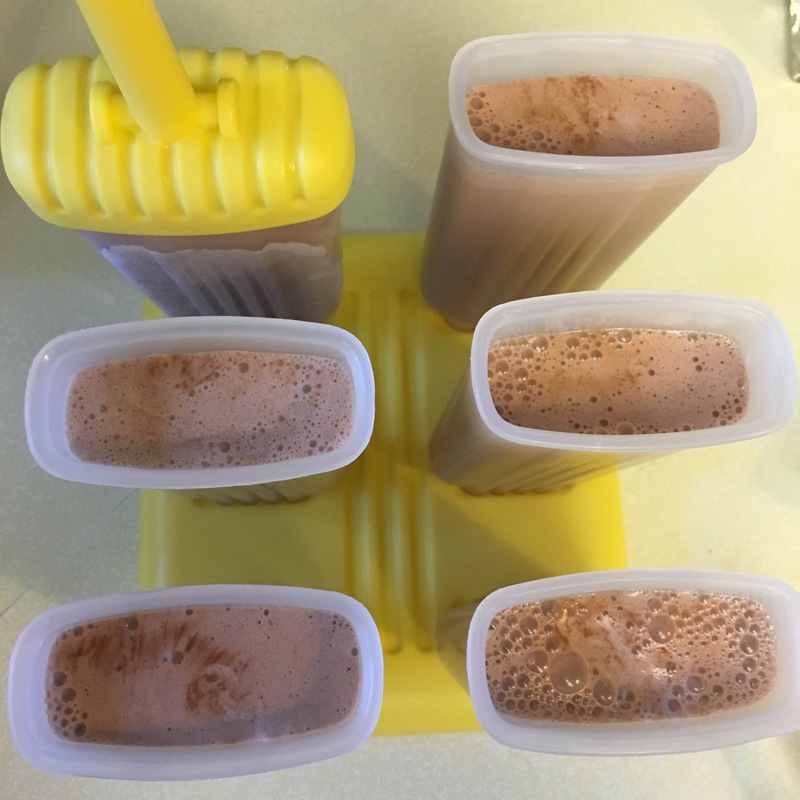 Add in nutella, blend until thoroughly combined, then pour mix into prepared popsicle molds. Freeze 4-6 hours or overnight. Remove popsicle sheath with a little bit of warm/hot water and enjoy. You may put sliced fruit or berries of your choice in the molds as well. Cut back the milk to about 1 1/2 cups instead of 1 2/3 cups. Sliced Strawberries and banana would be delightful. You could do raspberries or blueberries. If you wanted to make them adult – add about a tablespoon or two of Frangelico – Hazelnut liqueur. You can always taste test the milk and nutella blend before freezing and see if you prefer more nutella. There is no shame in that. I will not judge you. There is no such thing as too much nutella, am I right? So don’t be shy! If you have tried these out let me know. If you have any changes or suggestions to improve it, those are always welcome, too. I love the inspiration of others. Stay cool or warm wherever you are in the world! Have a fantastical week. Week 10, Royce Hall in a cloudless sky. The last 3 years of my education have been training me for what is about to come. I have been challenged, shoved out of my comfort zone, and spent hours upon hours gearing up for some of the most difficult classes I’ve ever taken. I am ready. I am Bruin Strong!! #iambruinstrong #uclatransferpride #weekten #ucla @hannahrae88 @sareen_demerjian @grace.vert let’s do this!!! 🐻#ocbruins #uclasendoff well done 💙💛🐻💛💙@uclaorangecounty #uclasendoff In just about a month I will start my UCLA journey. It’s already been such an incredible experience so far. I cannot get over the amazing spirit each and every Bruin I’ve come in contact with possesses. Thank you OC Bruins for such a fantastic and welcoming event.